Aaahhhh spring! The grass turns a beautiful lush green and the trees start leafing out. And here on the ranch it also means weaning time for the fall-born calves. Weaning the calves from their mamas takes a huge nutritional drain off of the dams and allows them to regain their proper body condition in preparation for their next calf, an important health step for a vibrant and healthy herd. We like our calves to stay with their dam until they are at least 7 months old, but we’ve weaned early when the conditions warranted such as during a drought. But weaning means much more than just separating mama from baby – proper weaning starts a couple of weeks earlier. It’s good to vaccinate calves beforehand since the stress of weaning can render their vaccinations less effective. In addition to the standard vaccinations to protect against illness, the heifers need their vet-administered calfhood vaccination (BANGS) between the ages 6 – 12 months so now is a good time to do that as well. Plus since it’s a requirement in our state by the Texas Animal Health Commission that all intact breeding animals have a permanent ID tag by a certain age. Any calves old enough, we’ll load up them too when we go. While we’re at the vet and the calves are already in the chute we will have the vet give them their vaccinations so we won’t have to stress them more by putting them through the chute again once we get home to administer them. The heifers will get their official big-girl bling orange ear tag from their BANGS vaccination, the bulls will receive their silver permanent ID tag. So a couple of weeks before the big day we bring the pairs up to the barn and separate all the mama cows from the calves. We’ll leave the mamas penned while we take the calves to the vet for their workup. We load up our future weanlings onto our trailer. But before we hit the road with this load of kids RancherMan does a safety check of the trailer. With this heavy load we want to make sure the tires are properly aired and he checks all connections from the trailer to the truck. At last we’re able to hit the road and drive these kids to the vet in a nearby town. The vet does his work in short order and in no time we’re back home again. Now that the calves are all vaccinated we reunite them with their mamas and send them out to a clean pasture for a couple of weeks. We’ll allow them to spend that time settling down & getting back into the swing of things. Then a couple of days before weaning we will move them all to a pasture close to the weaning pen so they can get comfortable there. Since there’s been no grazing pressure on this pasture for at least a couple of weeks the grass should be good & green, ready to provide healthy grazing as mama stays close to her calf on the other side of the weaning fence when the time comes. Finally the big day arrives and we sort and separate all the calves from their dams. We like to fence-line wean them for a few days as as it seems to reduce the stress on both mama and calf if they can hear and see each other, and even touch noses through the fence. But weaning time is a stressful time for the calf, keeping him constantly walking the perimeter of the paddock looking for a way back through. Good fences are a must! During weaning RancherMan & I are careful to offer the calves all the comforts we can – lots of fresh hay, green-grass grazing, cool shade trees, barn shelter and plenty of creep feed. At first the calves aren’t interested in eating much but after three solid days (and NIGHTS!) of instinctual bawling, both mama and baby start pulling away from the fence to eat and drink more often. That’s our que to move the mamas to a more remote pasture to allow the calves to get used to an adult life out on their own. Although bawling is reduced there is still some bawling for the next few days, but it doesn’t take long before the bawling stops completely and peace & happiness reigns once more at the ranch. These calves have really bonded with the other calf weanlings and they’re off romping and stomping together like best friends! 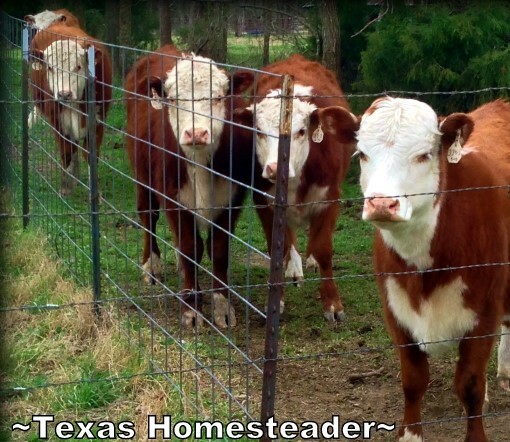 This entry was posted in Blog Posts and tagged Barn, Calves, Registered Hereford, Small Town Living, Spring on June 15, 2014 by Texas Homesteader. Sounds like you have a pretty big spread. I have only 5 acres, and although I only have one, or sometimes two cows, can’t really give them distance. I’d like to be able to wean the calves, but never have due to impracticalities. I’ll be getting heritage dual breeds soon, and would like to be able to wean just for the benefits. Any suggestions for a smaller farm? Very interesting to learn about! Thanks for sharing on Four Seasons Blog Hop! Sandra from Scrumtilicious4you! Do you keep these calves or sell them?